The movie Gone Girl is based on a book by Gillian Flynn, which was a huge best-seller. The simple plot is about a man whose wife disappears on their wedding anniversary. It turns out being more complex with a lot going on. The story is really unpredictable, keeping you on the edge of your seat. You will be surprised as the plot unveils itself. 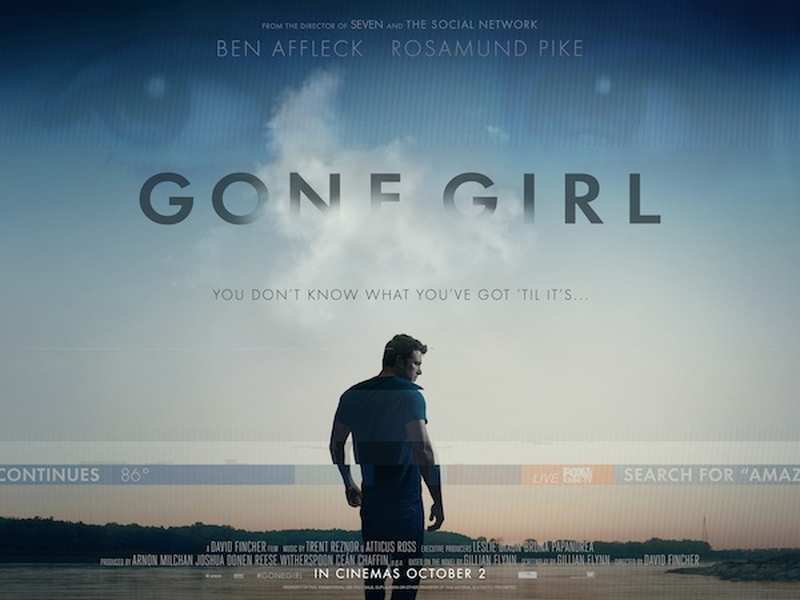 Do you want more movies like Gone Girl that is full of complicated and unpredictable plots? Hugh Jackman and Jake Gyllenhaal star as the father of a missing girl and the detective whose job it is to find her. At first, Prisoners seems like a kidnapping story, but the depth at which Hugh Jackman's character will go to put his family back together sets this movie apart. The number one suspect, played by Paul Dano, has mental difficulties, which also makes this movie different from others in its genre. This is the story of a woman who is waiting for her husband to get out of prison, but when he's finally home, she sinks deep into depression. After failed suicide attempt, she is prescribed a cocktail of medications. None of these work, so her psychiatrist gives her a new medication, one that ruins lives. The Girl with the Dragon Tattoo was a best-selling book by Stieg Larsson, that tells the story of a journalist who is trying to rebuild his career and credibility. He crossed paths with a hacker with a storied past of her own. They work together to solve a missing person case that happened nearly 50 years prior. The deeper they delve, the more dangerous the case becomes. This movie takes place in Boston where a girl was abducted. A private investigator works with the police to find her. As the story unwinds, it becomes more obvious that there is no one to trust. Even at the end when the case is finished. It presents an ethical dilemma that tests everyone's moral being. Zodiac is based on the true events of the serial killer nicknamed the Zodiac Killer. He was known in the San Francisco area for his puzzle-like letters and all the threats he made to the police. The movie tells the tale from the perspective of the obsessed investigators trying to find this man. The Staircase is one of the movies like Gone Girl, as it is another movie about a wife who has been murdered or disappeared, and her husband slowly creeps into the prime suspect position. This is an eight-part film where episodes are like chapters in a book, except they don't offer much of a break as the story is too riveting to set aside. Mystic River is a Clint Eastwood movie, starring Sean Penn, Tim Robbins and Kevin Bacon. The three are childhood friends, now grown with their own children. One of their daughters is found dead in the woods, murdered. The film weaves memories from the men's past and the present to search for the murderer of their daughter. Double Jeopardy is one of the movies like Gone Girl, except in this case, the husband is murdered and the wife is a suspect. While paying the price for her husband's murder, she hasn't yet committed and finds out that he's still alive. A Perfect Murder is the story of a Wall Street man, played by Michael Douglas, who learns that his young wife is cheating on him. He can benefit from her untimely death as he'll inherit her fortune, so he hires her lover to murder her. The "perfect murder" is anything but perfect. To Die for is based on a true story, in which a woman gets her younger lover and his friends to murder her husband. The plot is rich with murder plans and the psychopathic female star.